One of the most eagerly awaited events in Putrajaya, the International Hot Air Balloon Fiesta returns for its fifth edition in 2013. The festival which is scheduled to be held over a period of four days, from Thursday, 28th March to Sunday, 31st March, is scheduled to be hosted at the city’s Monumen Alaf Baru grounds. The Putrajaya International Hot Air Balloon Fiesta routinely attracts renowned international balloonists from countries like Belgium, Germany, France, Netherlands, USA, India, Thailand, Switzerland, Vietnam and of course, Malaysia. The balloon fiesta is projected to feature an assortment of colorful hot air balloons, most of which are expected to sport creative shapes and designs. Previous editions of the fiesta have featured balloon shaped like Darth Vader, Felix the Cat, Garfield and various other inventive designs. New at this year’s event will be a ‘Smurf balloon’ which will be piloted by Koen Audenaert of Belgium and a ‘Clown’ balloon which will be navigated by Sven Grenzner of Germany. The Putrajaya Hot air balloon is touted to be a fun affair for all the family, and hence the event aside from the hot air balloons, will also feature several fun activities like tethered hot air balloon rides, fun trips over the city of Putrajaya aboard a helicopter, and the brand-new, ‘Walk in the Balloon’ activity which will actually enable you to take a walk within a balloon. The fiesta will also feature the Mountain Dew Extreme Zone which will be equipped with various attractions and activities like a paint ball booth, a car simulator, a wall climbing facility, Zorbbing , Segway riding and KMX bike riding. All these attractions are bound to be hit with pre-teens and teenagers in the crowds, while younger children will enjoy participating in activities on- the- spot coloring contests. Yet another special event at the fiesta is the ‘night glow’ event, scheduled for the night of the 30th of March. During this event the balloons take on an ethereal air, when their colors are illuminated by their burners as they participate in an enchanting light and show. This event will then go on to culminate in a thrilling fireworks display. The last day of the festival, Sunday the 31st of March will feature a charming ‘Balloon Music festival’. 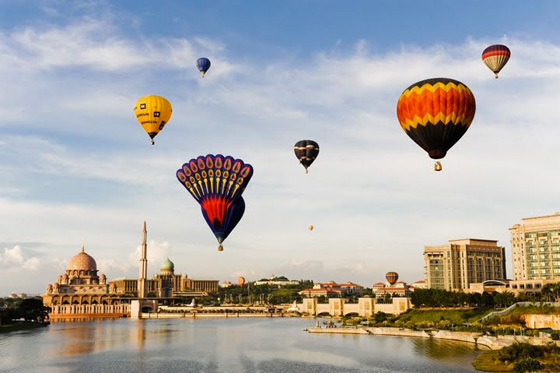 The Putrajaya International Hot Air Balloon festival promises to be a fun-filled event for all the family and if you plan to be in Malaysia over the school Easter holidays, you must include it in your itinerary. Date: From Thursday, 28th March 2013 - Sunday 31st, March 2013. Saturday 30th March - Night Glow. Sunday 31st March - Balloon Music Festival. Time: From 7 am until 9 pm (daily). Place: Millennium Monument (Monumen Alaf Baru), Precinct 2, Putrajaya.